How many pulleys will you need to drag the diva up on to the stage? Play the game to find out. Leonardo knew more about pulling than most. His ambitious stage designs included elaborate and imaginative pulley systems designed to lighten the load of any poor stage hand who would otherwise be expected to shift scenery using sheer brute force. So, in theory at least, a small child should be able to lift a herd of elephants just so long as he or she has enough pulleys and rope – and plenty of elephants. In reality, however, there is a limit to the number of pulleys we can use before friction between the rope and the pulleys causes the whole system to grind to an immovable and inevitable halt. 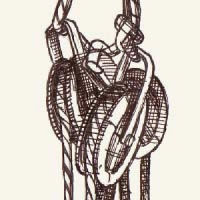 Although Leonardo used pulleys in his designs he doesn’t take the credit for inventing them. No one knows who did invent the pulley, but they were in use in Ancient Greece and possibly even earlier.